Three out of four ain't bad, right? I made Rachael Ray's Easter Brunch menu (called Easy Yet Elegant Sunday Brunch in Get Togethers) and of the four recipes, three were huge hits and the fourth failed because I am a rookie cook. Hey, you live and learn. And if that doesn't work, just serve mimosas. That works too. 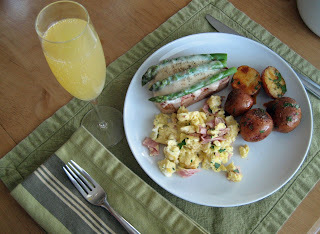 The menu included Roasted Red New Potatoes with Sweet Paprika Butter and Parsley, Elsa's Ham and Asparagus Toasts, Broiled Citrus Salad with Cointreau and Brown Sugar and Scrambled Eggs with Smoked Salmon (although I used ham, not salmon). The recipe that didn't turn out was the Broiled Citrus Salad, but it was entirely my fault. I thought I was being a smart cook by putting the brown sugar on top before I was ready to put it in the oven. What actually happened was that the sugar dissolved, so there was nothing to get all caramelized and yummy on the top. E for effort. Holding 1 spear at each end snap off the tough stem of asparagus. Use this spear as a guide line to trim the bundle with a sharp knife. Simmer asparagus in salted boiling water 3 minutes. Drain and run under cold water. Cut asparagus to fit the size of the toasts. Toast 8 thick slices of farmhouse style bread under a preheated broiler 6 inches from heat. Combine softened butter and mustard. Spread the toasted bread with mustard butter. Cut sliced ham into smaller pieces to process. Grind the ham in your food processor. Spread the toast with ground ham. Arrange steamed asparagus spears on top of the layer of ham. Top each toast with a few grinds of black pepper and a mound of fontina cheese. [I forgot the pepper but remembered at the last minute.] Return toasts to hot oven under broiler and cook toasts until cheese melts and lightly browns at edges. Arrange ham and asparagus toast on a platter and serve. Sort potatoes. Potatoes that are 2 inches or less in diameter can be left whole. Halve remaining potatoes. Coat very lightly with a drizzle of extra virgin olive oil and roast potatoes 20 to 25 minutes, until just tender. Transfer potatoes from the oven to a bowl. Whisk your eggs and cream together. Add 1/2 of your chopped chives and season eggs with salt and pepper. Preheat a large nonstick skillet over medium heat. Melt butter in the pan and add eggs. Scramble eggs with a wooden spoon. Do not cook eggs until dry. When eggs have come together but remain wet, stir in chopped salmon. Remove pan from the stove and place on a trivet. Garnish the eggs with remaining salmon and chives and serve right out of the warm pan. Ooh those new potatoes and eggs sound great- I haven't tried paprika on my new potatoes before, I will definitely have to give it a try someday! I too would have substituted ham for the salmon, myself! The toasts and potatoes look delish. Jennifer - it was one of those "I can't believe I made this" meals for me. Although, most meals are that for me. Cate - They certainly were. Now I have to learn how to set the table as nicely as you do.